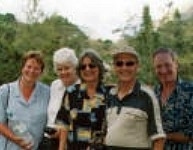 Latin American Ministries was started by a small group of friends, led by Noel and Sandra Quinlan who have served as missionaries for many years in Brazil and seen first hand the desperate need of so many of the children there. It obtained official Charity status in the UK in 1999; reg. no. 1083180. The Charity's first Board of Directors was composed of: Noel & Sandra Quinlan, Jim & Vina Higgins and Phyllis Nellins. Raymond ad Ruth Griffiths later joined us and Vina and Phyllis retired. All have a real heart for Brazil and the plight of so many of the children there and have dedicated themselves to help in every way possible; speaking on behalf of the children in different churches; running auctions; sales; sponsored walks; special teas and many other things. LAM also has dedicated helpers in various towns, led by Esther Goggins and Christine Harris in the UK and Tony and Joan Meade in the South of Ireland. ministry to the Ticuna, Amazon Indians and support for national pastors and workers. By 2004 the children's work had grown to the point that several schools had been built and "SMARTkidS", a sponsorship programme, was started to help maintain the growing number of children being reached. organization, Overseas Radio and Television. ORTV makes programmes for radio and TV, teaches English in a major way and has a musicalministry which travels the world, called Heavenly Melody Singers. All of these means are used to bring the message of the Love of Jesus. Mark worked as a sound engineer and travelled with the music group all over Taiwan and abroad. Vivian worked in the crèche and learnt English and Chinese there. Mark and Vivian joined LAM on their return to Brazil in 2003. Mark is now a Director for Brazil and Vivian is the National Secretary.